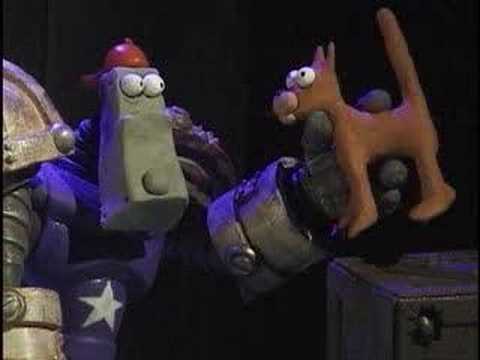 Since I just mentioned Armikrog, Doug Tenapel’s upcoming adventure game in my Blazing Dragons review, why not talk a little about this popular artist? For most gamers, Doug Tenapel is famous for the Earthworm Jim games in the 90s, some of the most memorable and popular games from the time of the Super Nintendo and Genesis. After leaving Shiny Entertainment, Doug Tenapel, along with a few other ex-Shiny employees, founded The Neverhood, Inc., and from what I researched, made only three games. The first game was the cult classic PC adventure game, The Neverhood Chronicles or The Neverhood for short. Didn’t sell well, but became a cult classic game that is now very expensive. The next game was named Skullmonkeys for the PlayStation. Didn’t sell well either, but it also became a cult classic that is now expensive online. The final game was called Boombots, a Power Stone-style fighting game for the PlayStation. As you can guess, it didn’t sell well, but from what I have seen online, it hasn’t become a super pricey game or a cult classic. Why? Out of all three games, why didn’t this one get the same response? It still has a lot of the elements of The Neverhood, Inc.’s past games like stop-motion Claymation and the trademark humor of the games. Let’s find out then why this little 3D fighting game is often forgotten by many gamers. The story is paper thin. You have a bunch of green alien cats coming to Earth to take it over and rule it as their own. The only way to stop these evil alien cats is to do the obvious, make robots to take them out! It is up to the group of robots known as the Boombots to stop these alien cats and save the day! They could have easily made a giant green dog to chase them off or shoot them out of the sky themselves, but I digress. Like I said, the story is just there to get you from level to level. Some of the cutscenes are cute, but you can just skip over the story and not miss anything. The gameplay is of a Power Stone-style fighting game, where you choose from an eccentric cast of robots that were each made from different parts of the world. 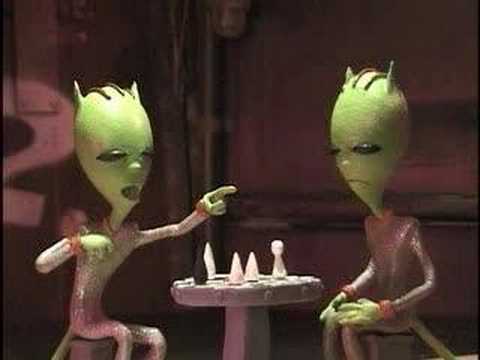 For some reason, Klaymen from The Neverhood series got into the situation and well, they fight each other. Instead of throwing punches and every character having different moves, each character can use a rapid-fire gun, guided bombs, and use things called SCUD missiles. Each character does have a different set of throws that do different ranges of damage. Even if all of the characters have the same attacks, they do play differently enough to be varied. The fighting engine is pretty simple and easy to get into. There isn’t a whole lot of depth to the fighting, but if you are one of those gamers that doesn’t enjoy complex fighters, then this game is for you. In terms of features, you only get the multiplayer and the single player mode, and that’s it. The game is graphically on par with PS1 games at the time of its release and it isn’t too bad. Sure, some characters look a little blockier than they should, like Klaymen, but they aren’t bad looking graphics. The music is also a bit simple, but solid. It can be forgettable, but the menu music for better or worse did get stuck in my head. Voice work is limited to only a few lines at the beginning and other parts of the game. The humor also leans more towards toilet humor than the previous two games The Neverhood, Inc. made, but I did laugh at a few of the jokes. I also like how the robots all look different and have their own fun perks playing as them. So, where does this claymation fighter fall short? Well, I would say out of the three games The Neverhood, Inc. made, this is easily the weakest in terms of content and design. The game is a bit too simple for its own good. I did say there was some strategy to the combat, but you can easily abuse certain strategies for each fight. I won most of the fights by abusing the SCUD missiles and grab moves since they did the most damage. I will give the game credit that, in order to unlock the different characters, you need to go through the game without losing a single fight. However, you can abuse that also, since each time you finish a fight, you save the game after you win. This means if you lose in the next round, you can just quit, head back to the main menu, and keep re-trying that fight until you win the first round. I felt like this game should have been some kind of side-scrolling brawler and not a 3D fighter. Like I said, the humor is a bit more immature, and it’s a shame since The Neverhood and Skullmonkeys had varied kinds of humor and yeah, there is some variety in the humor in Boombots, but it not as good as the team’s previous games. This game gets a 6 out of 10.